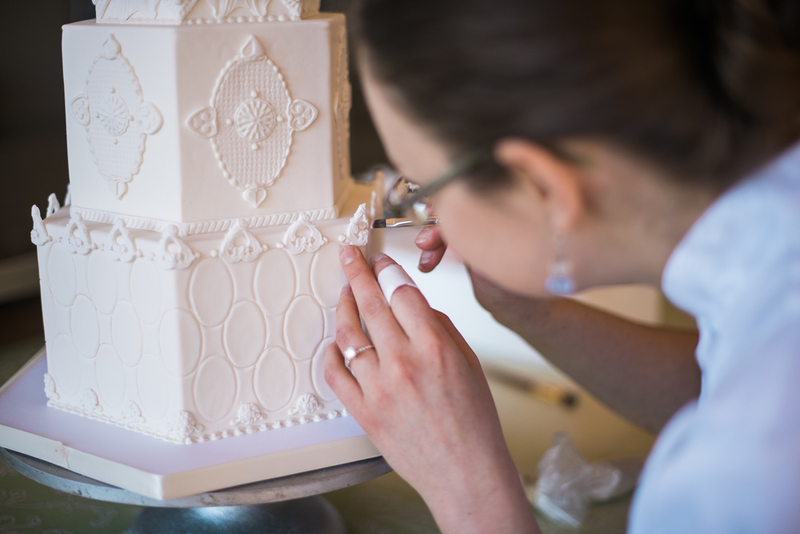 What inspired you to become a pastry chef and create wedding cakes? I had been baking since the age of 8, and became interested in all the cooking shows on TV as a teen. I would watch them in the afternoons, after school, and then turned to experimenting with new cooking and baking techniques in our kitchen at home. I developed a keen interest in art, sculpture, and ceramics as a teen and was developing a great skill set as a potter, without realizing that one day, these sculpting skills would translate perfectly to the medium of sugar. Indeed, when I went to college, it hadn't occurred to me that I could pursue baking as a career, so I pursued journalism, languages, and history. I ultimately graduated with a Master's degree in environmental policy, then worked briefly in academia and later became a newspaper copy editor. After taking the life-changing decision to move to the US, I made another major career change that saw me returning to school to study midwifery, which was followed by a couple of years of training and working as a midwife in Oregon. (Obviously I was still figuring out what my calling in life really was!) Ultimately, I had burnt out on the politics of my profession and was completely exhausted by the irregular schedules, long workdays (and nights), sleep deprivation, and the need to be on call almost constantly. Out of necessity, I carefully rethought my personal goals and opened my mind to the possibility that I could make my living doing something positive and creative that would not deplete me emotionally or physically. I had a sort of epiphany one day that baking had always given me great joy and personal satisfaction. I bought a library-full of books on the subject of pastry and the sugar arts, signed up for professional classes (with cake masters like Kaysie Lackey, Maggie Austin, Zoe Clark, and Nicholas Lodge), and set about teaching myself everything else I'd need to know in order to pursue baking full-time. My goal was (and is) to become influential in my field, and to connect my customers with the pure and simple delight of a well-executed, beautiful, and delicious cake that is intended to anchor and augment the memories of our happiest celebrations in life. What is your favorite cake, filling & frosting combination? Of course I'm going to tell you that my palate changes all the time with regard to cakes! I modify my cake menu every 6-8 months to honor the seasons and also to keep myself excited about developing new flavor profiles. My favorite right now is a lime-scented buttermilk cake with burnt orange French buttercream filling and a lime whipped cream frosting. Buttermilk cakes generally have a tender, moist crumb because of the acidity of the buttermilk. French buttercream is made with egg yolks, so it has a beautifully rich mouthfeel. In contrast, the whipped cream frosting is fluffier and more delicate and is only barely sweet. The cake's overall flavor and texture are perfectly suited to my tastes. I don't have much of a sweet tooth (!! ), so I like to ensure that all my cakes have a good balance of sweetness and tartness/bitterness to create harmony and deliver good flavor without obliterating your palate with sugar! WHAT IS THE BIGGEST TREND YOUR SEEING RIGHT NOW IN WEDDING CAKES? Naked cakes are BIG. Everybody wants one. They're unfrosted, which means the inside of the cake (all the layers of cake and frosting) aren't hidden by any exterior treatments like buttercream or fondant; instead, everything is exposed. This sort of cake is all over Pinterest and is also popular on the various wedding blogs I read each week to remain up-to-date on wedding trends. I get approached at least once a week by couples seeking a naked wedding cake, because to them, this is an entirely unique idea. What's funny is that I was commissioned back in 2012 to make a naked cake for Seattle Met Bride & Groom's Winter-Spring 2013 issue (you can see it here), which was certainly not the first time a baker has ever made a naked cake, but they've really exploded in popularity this past year. Textured buttercream cakes are still in high demand at Honey Crumb. I expect for 2015/2016 that we'll see some variations on this trend, like tinted buttercream finishes and more whimsical textures than just horizontal spatula-grooves or the stucco-type finish. My personal wish is for the trend pendulum to swing back to more intricately detailed cakes that use more of a baker's finer talents, like Royal Icing piping (in perhaps more modern graphic patterns or abstract floral designs than the super-traditional Royal Icing stringwork or brush embroidery, which definitely look out-of-date to me now). My specialty (and real joy!) is to create sugar flowers by hand, so that the species, color, and size can be customized for each cake. They are thus unique pieces of art and are highly personal – I'd like to see sugar flowers returning to the foreground of wedding cake design! What do you tell brides who hope to save money by making their own cakes? Haha! I don't usually get to meet those brides, because by the time they come to me for a consult, the issue of whether they're making their own cake or not is moot. But, for those I haven't met who want to DIY – I can only use myself as an example here. I'm getting married in October and I'm NOT making my own cake! We have hired one of the best in the business to create something magical for us (and, apart from the cake's color palette and overall “feel”, the design itself will be a surprise!). I want to be the bride, not the baker, for my own big day. I simply want to attend my wedding, not host my wedding, or work on a cake the night before when I could be enjoying myself and delighting in the company of all the wonderful guests who've come from near and far to celebrate with us. Needless to say, it is a massive amount of work to make even a simple tiered wedding cake, and even those brides who are keen and talented home bakers will still be devoting a large portion of their pre-wedding week to the creation and adornment of their cake. Worse still, for those who haven't ever made a tiered cake for a formal celebration before, there is a steep learning curve. Steep learning curves generally entail one thing: stress! Trust a pro and you will never regret it. What makes your cake studio unique & special? The space itself, for starters, is really beautiful! We are lucky to have so much natural light and so many giant windows, which permit a special view of the water and of the people and cars energetically going by every day on Western Ave West. It's 2,500 square feet and has every tool in it that a pastry chef and cake artist could possibly want. In short, it's my cake paradise. In a more philosophical sense, the cake studio is just that: a studio, not a cake factory. We think of it as a collaborative space where artists come to work. It's a positive, creative environment where assembly-line, high-volume, repetitive baking has no place. Each project is unique, each client is unique, and the skills that serve you best if you work for me are not generally acquired in pastry school, where volume and speed and consistency are valued above all else. 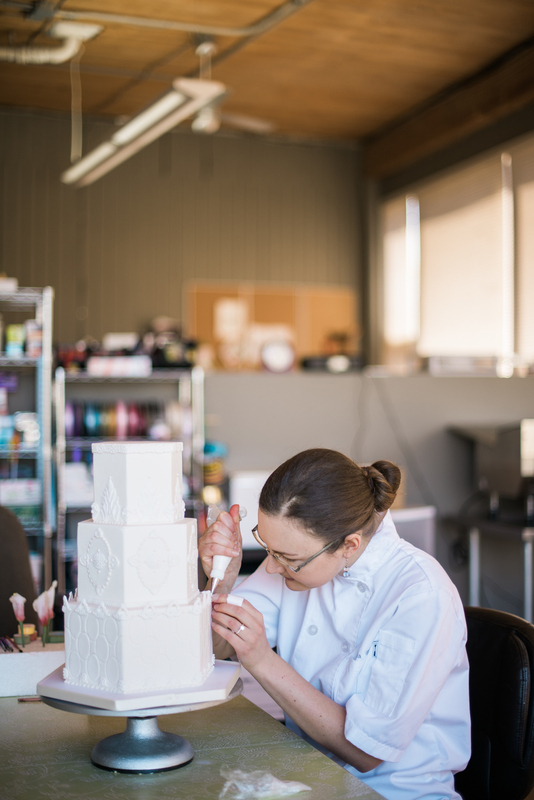 What's most important at Honey Crumb is a sense of color, proportion, and scale, and the desire to solve technical problems as they present themselves (since each new cake design is unlike the one that came before). What's also important (to me) is for everyone at Honey Crumb to be well nourished, well rested, creatively supported, and to have the time and freedom to act autonomously on projects that excite them. This is how we create our best work, and is also how the career of baking can be made sustainable for each member of the team (no burn-out mentality here!). What's the most common misconception about wedding cakes? I'd venture a guess that the most common misconception is that a wedding cake is relatively easy to make and is much like making a layer cake at home (and should thus be priced accordingly). As I learned myself, through trial and error, this is not the case. There is an immovable deadline, to start with, and a fragile, perishable product that must be created at the highest possible level of quality. 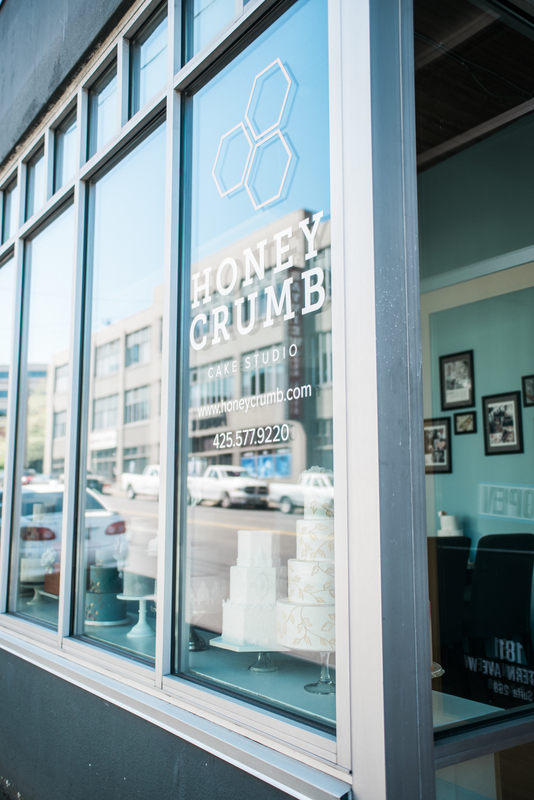 At Honey Crumb, we work with beautiful ingredients and approach the baking process with integrity in all respects. This increases the pressure, in a sense, because the goal is to highlight the dessert-like quality of the cake (i.e. it's about eating, after all, and not just art!). The time window is thus pretty narrow – we bake the cake as close as possible to when it'll be consumed (to ensure freshness) and we deliver the cake as close as possible to when it will be admired by the couple and their guests (to ensure the integrity of the cake with regard to weather conditions, long-distance transport, etc). The goal is not only to achieve flawlessness of finish but also to produce a unique creative entity that symbolizes the couple's union and expresses their personal tastes. So, there has to be a lot of heart and love in the process as well! For us it's a way more serious endeavor than baking a layer cake at home, and is logistically much more complex. I sometimes joke that the specialty wedding-cake business is like the Olympic games of the pastry world: you have just one shot at perfection, with no easy backup or opportunity for a do-over, which means the stars must align on the day with your talents and all your preparation in order to create a gold medal-worthy performance! Any advice for brides on a budget? Yes! Research your baker's website to be sure you know what their general price range is before you schedule a consultation. Then, when you meet, tell your baker upfront what your restrictions are. When you go shopping for a wedding gown, the first question usually involves what your budget is, so that you don't have to face the disappointment of falling in love with something that's way out of reach. The same applies to cakes. During every consultation I have with clients, we discuss cake pricing and go over various design options that take into account what they are comfortable spending. We have a minimum order per serving for all our cakes (to cover the labor and ingredients regardless of the exterior design they ultimately choose), but the price per serving increases according to the complexity of the cake décor. Cakes are handmade products and can be as simple or as intricate as your vision and budget allow. So, if I know at the outset what a client's wish is for the look of the cake, and also what their budget is, then I can be mindful throughout the design process and am almost always (i.e. 90%) successful at achieving a happy balance between the two. As I said earlier, I don't have much of a sweet tooth. I will take small nibbles of cake and buttercream as needed throughout my work week to ensure that quality is maintained, so what I really want when I get home from work is a hanger steak and some bitter greens (which my husband-to-be cooks to perfection, because he is both a caveman and a nurturer at heart). However, once my essential nourishment is taken care of, my favorite dessert is a couple squares of dark chocolate, alternated with a handful of salted almonds. Such a tasty and timeless combo. Or, lately I've been making these strawberry chia-seed popsicles sweetened with maple syrup. They're tart and cold and crunchy and one is enough!